Nepal Foreign Affairs (KATHMANDU, 11 Saturday 2018) – Nepal and Bangladesh have agreed to work together in the development of the energy sector. The two countries on Friday signed a Memorandum of Understanding on power exchange cooperation which was much talked-about for long. 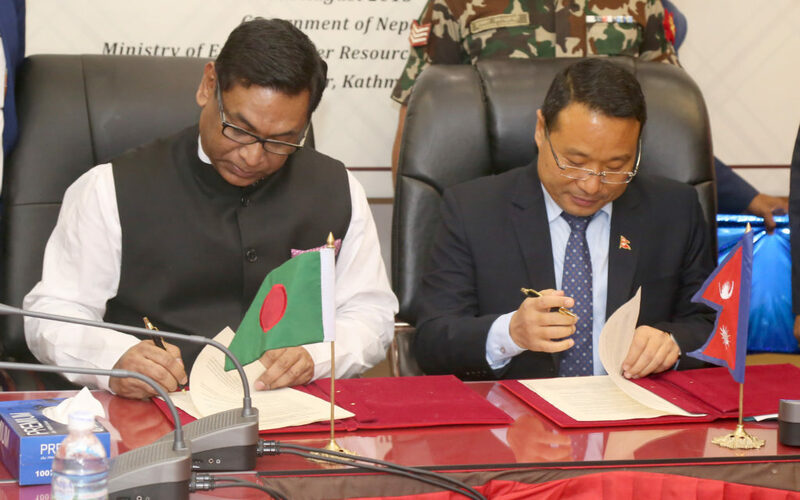 Minister for Energy, Water Resources and Irrigation Barsha Man Pun and Minister of State for Power, Energy and Mineral Resources of Bangladesh, Nasrul Hamid, signed on the MoU. Bangladesh had been showing interest in joint investment in the energy sector in Nepal since long. As per the MoU, a joint executive committee at the Energy Secretary level and the joint technical group at the Joint Secretary level would be formed for bilateral collaboration. The two bodies would convene their meetings within the coming two months to determine the future course of action. Moreover, Minister Pun said that the government of Bangladesh is ready to immediately purchase 500 megawatts of power from Nepal in accordance with the MoU. Prior to this, Nepal has already signed bilateral agreements with India and China on energy cooperation. The government signed the MoU now with Bangladesh in a bid to expand Nepal’s energy market to the regional level. Minister of State for Electricity, Energy and Mines Hamid said that his country had come up with the move to cherish the dream of his people and address growing energy needs in his country. The government and private sector of both the countries will work together to tap Nepal’s umpteen potential in hydropower, he noted, terming today’s agreement signing a matter of historic importance. Informing that his country has set a target to graduate to the league of developed countries by 2041, he said they would need around 60,000 MW power to meet the target. Nepal is an appropriate alternative source for this, he added. “We require 24,000MW electricity by 2021. Now, Bangladesh has the economic growth rate of 7.2 per cent and has set the target to increase this to 10 per cent by next year,” he asserted. In a press meet after signing the MoU, Minister Pun and Bangladeshi State Minister Hamid shared that they will hold talks with India on the issues of a transmission line. It is expected that Prime Minister KP Sharma Oli and his Bangladeshi counterpart Sheikh Hasina will hold talks regarding the issues with Indian Prime Minister Narendra Modi in BIMSTEC meeting to be held in Kathmandu on August 30. Minister Pun further expected that the electricity generated in Nepal could be exported to Bangladesh by developing a SAARC level grid.